Featured in the #1 spot in 2019 "Get Motivated" podcasts on Apple Podcasts • Nominated for a Webby Award for Best Business Podcast From the creator of the #1 podcast "Don't Keep Your Day Job," an inspiring book about turning your passion into profit The pursuit of happiness is all about finding our purpose. We don't want to just go to work and build someone else’s dream, we want to do our life's work. But how do we find out what we’re supposed to contribute? What are those key ingredients that push those who succeed to launch their ideas high into the sky, while the rest of us remain stuck on the ground? Don’t Keep Your Day Job will get you fired up, ready to rip it open and use your zone of genius to add a little more sparkle to this world. 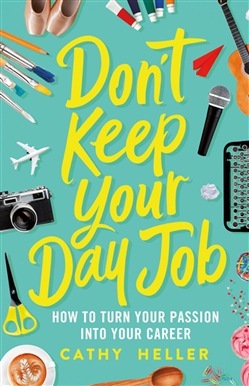 Cathy Heller, host of the popular podcast Don’t Keep Your Day Job, shares wisdom, anecdotes, and practical suggestions from successful creative entrepreneurs and experts, including actress Jenna Fischer on rejection, Gretchen Rubin on the keys to happiness, Jen Sincero on having your best badass life, and so much more. You’ll learn essential steps like how to build your side hustle, how to find your tribe, how to reach for what you truly deserve, and how to ultimately turn your passion into profit and build a life you love. Acquista Don't Keep Your Day Job in Epub: dopo aver letto l’ebook Don't Keep Your Day Job di Cathy Heller ti invitiamo a lasciarci una Recensione qui sotto: sarà utile agli utenti che non abbiano ancora letto questo libro e che vogliano avere delle opinioni altrui. L’opinione su di un libro è molto soggettiva e per questo leggere eventuali recensioni negative non ci dovrà frenare dall’acquisto, anzi dovrà spingerci ad acquistare il libro in fretta per poter dire la nostra ed eventualmente smentire quanto commentato da altri, contribuendo ad arricchire più possibile i commenti e dare sempre più spunti di confronto al pubblico online.